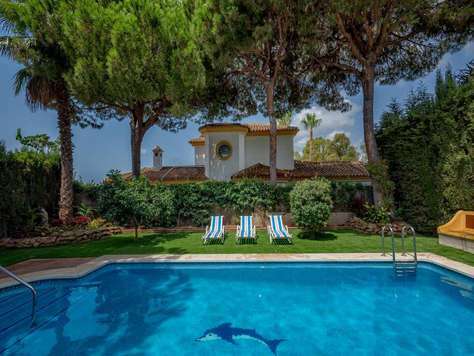 Newly redecorated and refurbished 6 bedroom villa for rent in Costa del Sol. Stunning sea views, 5 min walking distance to the beach, WiFi, swimming pool, the UK TV box on demand. This superb villa for rent is located in 5 minutes walking distance from the beach. It is made up of three floors and can accommodate up to 12+ guests. Pool heating is available during winter months for 300 euros per week, can be decided upon arrival depending on weather conditions. This newly renovated 6-bedroom villa for rent is superbly located in a prestigious Riviera del Sol, just 7 minutes from the coast’s best beaches. With stunning sea views, big swimming pool with hydromassage, high-speed internet, unsurpassed luxury awaits you. Sleeps as standard 13+. This three level house for rent has 6 bedrooms and 5 bathrooms. Almost all rooms of the house, including the master bedroom and the second bedroom on the top floor, the living room, the kitchen and one of the bedrooms on the main floor, really do have a view worth waking up to every morning. Check it out! Enter the villa through double antique wooden doors you know you have arrived at a very special property. Immediately, you are drawn into the magnificent living room, which gives you a real sense of space, light, tranquility and calm – ready for your luxury holiday to begin. Spacious living room with fireplace has stunning sea views. Kitchen is airy, modern and fully equipped, with a kitchen isle. The main floor also offers two bedrooms. The top floor of this holidays villa for rent offers two generous size bedrooms with en-suite bathrooms and fitted wardrobes. Both bedrooms enjoy stunning sea views as well as a spacious terrace of the top floor. The top floor has direct access to the garden via separate stairs. The ground floor offers a living room and two other bedrooms. There are 5 bathrooms spread out over the three floors. Villa Aquarelle offers stunning sea views, spacious terrace with dining area and lounge next to the large private swimming pool. The second terrace on the top level with breathtaking sea views offers access to both spacious bedrooms of the top floor. This holiday villa for rent offers breathtaking panoramic sea views from almost all the windows, both terraces and the garden also enjoy sea views. Bedroom 1: double bed + bunk bed, en-suite bathroom, fitted wardrobe, treadmill. Close to all amenities, yet secluded, this villa for rent has everything you may need for your perfect vacation. Riviera del Sol area is well known for its perfect restaurants, supermarkets and sandy beach. The location of this villa is perfect, it's 5 min walking distance from beach, 3 supermarkets, a lot of restaurants and bars, drug store etc. This luxury 5-bedroom villa for rent is superbly located in a prestigious Calahonda in a 5 minutes walk from the coast’s best beaches. With big swimming pool, high-speed internet, your perfect Spanish holiday awaits you. Sleeps as standard 10+1. Enter the villa through double antique wooden doors you know you have arrived at a very special property. Immediately, you are drawn into the magnificent living room, which gives you a real sense of space, light, tranquility and calm – ready for your luxury holiday to begin. Spacious living room with fireplace is divided into living area with flat screen TV and dining area with impressive dining table surrounded by 12 stylish chairs. Modern and fully equipped kitchen of this holiday villa for rent is also located on the main floor. One of two master bedrooms with en-suite bathroom and walk in wardrobe forms a totally separated block of the main floor. The main floor also offers a guest bedroom and a bathroom. This superb villa for rent is located just 5 minutes walking distance from the beach. It is made up of two floors and can accommodate up to 11 guests. Two level house has 5 bedrooms and 4 bathrooms. All bedrooms are fully equipped with A/C and fitted wardrobes. Calahonda area is well known for its perfect restaurants, supermarkets and sandy beach. The location of this villa is perfect, it's 5 min walking distance from the beach, 3 supermarkets, a lot of restaurants and bars, drug store etc. This lovely two level 3 bedroom holiday villa for rent in the centre of Calahonda is conveniently located close to local supermarkets and a bunch of restaurants catering all tastes. The beach is only a 15 min walk. This luxurious holiday villa for rent is tastefully decorated and refurbished with quality furniture. Entering through the wooden doors you will feel that your great vacation has started! The seating area of the spacious living room on the first floor has two comfortable sofas, fireplace and Satellite TV, and a dining area. Through sliding doors you get to the patio with outdoors dining and lounge areas. The stairs lead you into the private garden with a swimming pool. High-speed Wi-Fi and air conditioning throughout. Lovely fully equipped kitchen offers many extras including coffee maker, dishwasher and washing machine. Master bedroom offers relax on the adjustable king size bed with remote control and in jacuzzi bath next to the balcony. Other two bedrooms also offer king size beds with quality mattresses and private bathrooms with bathtubs/shower. Sleeps as standard 6. This holiday villa for rent is situated in Calahonda, near the golf couses and in a 15 mins walk from the beach. The property is within 1 min to local bars, restaurants & supermarkets. The perfect sandy beach and the main shopping plaza with supermarkets, numerous restaurants, bars and nightlife is only a 15 mins walk from this holiday apartment for rent. A beautiful newly built wooden promenade 6 km along the seashore gives a unique opportunity of walking or running, chasing sunsets or enjoying dawn over the sea. The well known local village Calahonda is located mid way between Fuengirola and Marbella. 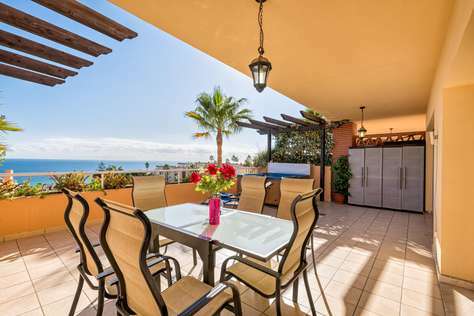 Walk to the Beach, Relax by the Pools, Have a Horse Ride, Enjoy Restaurants with Flamenco Show staying at this elegant holiday apartment for rent in Club La Costa World resort. 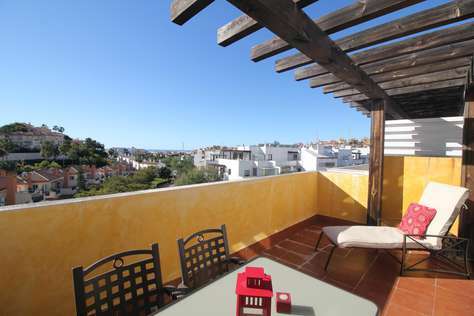 Have a perfect Spanish vacation at this 2 bedroom apartment with enormous terrace with room for 6. With a modern living room with flat screen TV, charming patio for dining al fresco and a great location within walking distance to the beach, your group will fall in love! And our quiet, secluded Alta Loma building in full of life Club La Costa World resort is family-friendly and close to both Marbella and Fuengirola highlights. This traditional yet modern Spanish holiday apartment for rent is welcoming and home-like, just as a beach apartment should be. The living room, with its flat screen TV and a comfortable couch, opens to a huge outside desk with a dining area. They are the main gathering place of the apartment. This apartment sleeps 6 and is perfect for families with kids and parents traveling together—thanks to its unique layout. One bedroom has a king size bed 135cm, and the other has two twins. Living room has a pull out sofa bed of 150 cm width. The master bathroom has a shower and a tub, the second bathroom has a shower. The open plan kitchen is right off the living room, with lots of cabinets and all appliances. Its bar counter seats 4. The kitchen and dining space outside are open to the living room, so you can still enjoy ambiance of exotic gardens and long conversations over fresh Mediterranean seafood. Or take your feast to the huge desk. The outdoor dining space seats 6 and has lots of other seating, too. Our surroundings inside the gated community are quiet and secluded. Step down to an area of Club La Costa resort and you are in a different world! …or grab a book and sink into a poolside sunbed to enjoy the sun! It’s Spanish vacation! The beach is only a five minute walk or take a wee train, it's fun for kids! The apartment is right in front of Club la Costa World main heated pools and it's a real treat during winter. Or check out all 6 restaurants with their nightly entertainment programs, a tennis court, basketball/ mini football playgrounds, local minimarket - all on your way to the Beach. Picturesque local town Fuengirola with its unique Promenade ambience, one of the biggest shopping centres Miramar and ancient Castillo Sohail are all within walking distance from the apartment. Have a classic Spanish Vacation on Costa del Sol! 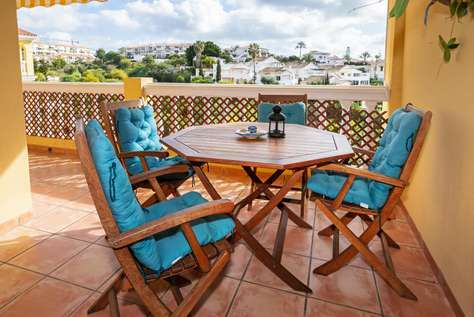 Have a perfect Spanish vacation at this 2 bedroom apartment with enormous patio with capacity for 6 persons. With a modern living room with flat screen TV, charming patio for dining al fresco and a great location within walking distance to the beach, your group will fall in love with this apartment! 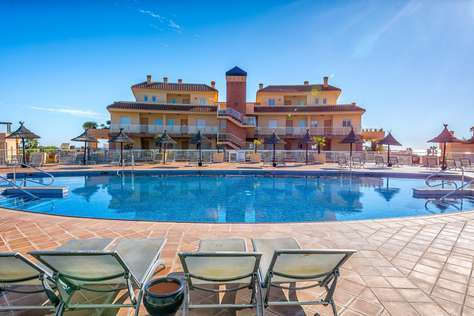 The quiet and secluded Alta Loma building is yet situated in the full of life Club La Costa World resort, close to both Marbella and Fuengirola highlights. It can offer you great onsite facilities, as family-friendly swimming pools, restaurants, gardens and many other perks. This traditional yet modern Spanish holiday apartment for rent is welcoming and home-like, just as a beach apartment should be. The living room, with its flat screen TV and a comfortable couch, opens to a huge patio with a dining area. This apartment is perfect for families with kids and parents traveling together, thanks to its unique layout. The master bedroom has a double bed, and the other has two individual beds. Living room has a pull out sofa bed for two persons. The master bathroom has a shower and a tub, the second bathroom has a shower. Baby cot is available. Or take your feast to the huge desk. The outdoor dining space seats 6. You can also relax and sunbathe on sunbeds in your small private garden. Our surroundings inside the gated community are quiet and secluded. Holiday chalet for rent in Riviera del Sol. Ref. 71890. 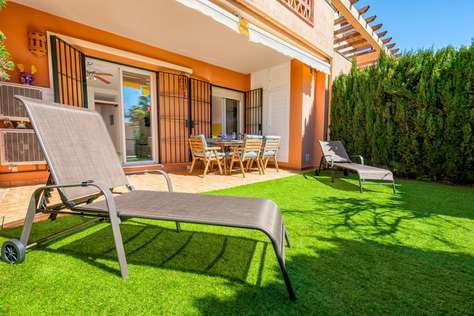 This beautiful recently renovated chalet 3 bedroom townhouse for up to 6 people is conveniently located within gated community Begonia 2 of Riviera del Sol. In this modern house your vacation will be exceptional having available a communal pool, a roof solarium with sea views, high-speed Internet, air conditioning, a private garden with outdoor dining area and many more! Practically all the rooms have a lot of light thanks to the floor to ceiling windows with beautiiful views. It gives a real feel of relaxation. Check it out! This bright and spacious 3 storey house offers 2 master bedrooms with king size beds and en suite bathrooms on the second floor. The third bedroom offers 2 single beds. All bedrooms enjoy high quality bedding and linen. The main floor of the house consists of the reception hall, airy living room with floor to ceiling windows that open to the beautiful gated patio and further to the garden, spacious fully equipped kitchen and the guest toilet. The second dining area is found outside in your private garden to enjoy your meals al fresco. In the garden you will also enjoy a lounge area with grass and a big sofa and a barbecue area, which makes this place perfect for families with kids or for companies of friends. The living room offers sitting area with sofa and flat screen TV set with International TV box on demand. The kitchen has oven, microwave, dishwasher, washing machine kettle, juicer, coffee maker, toaster, kitchenware, crockery and cutlery. The newly built community is secure and gated, the area is well maintained. The commal swimming pool and parking lot are gated and for residents/tenants only. While you can enjoy the quiet environment, the beach and local shopping area supermarkets, shops, restaurants and bars is only about 5 minutes by car. Emblematic towns as Marbella, Benalmadena, Ronda, etc are within 10-15 minutes drive. Don´t miss the perfect sandy beaches of Marbella, the Dove Park in Benalmadena with rabbits and hens walking there freely and the impressive historical monuments of Ronda! Foldable extra bed on demand for 10 euros per night. Cot and high chair are available for 5 euros per night each. Holiday chalet for rent in Costa del Sol. 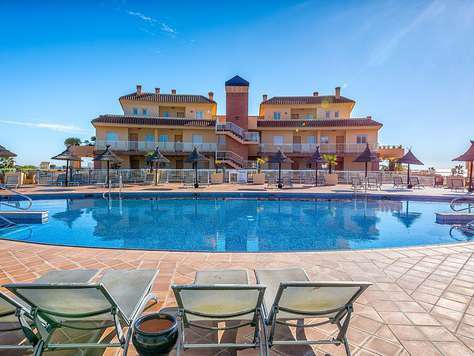 This lovely 3 bedroom 2 bathroom holiday apartment for rent with a big terrace offering stunning sea views sits among beautiful golf courses of Calahonda. It is conveniently located close to local supermarkets and a bunch of restaurants catering all tastes. The beach is only a 6 min drive. This holiday apartment for rent is tastefully decorated y refurnished with quality furniture. The seating area of the modern living room has a comfortable sofa bed and TV set, and a dining area. High-speed Wi-Fi and air conditioning throughout. Two other bedrooms feature 2 single beds, both have pool and gardens views. 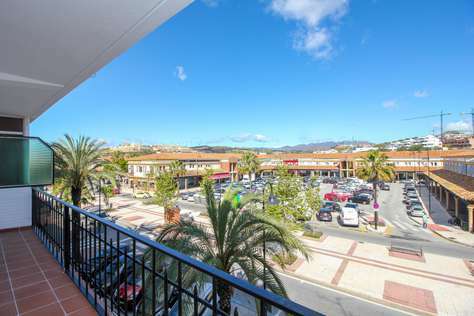 Centrally located within Calahonda Royal, the property is within 5 mins to local bars, restaurants & supermarkets, a walk through the complex will take you to the Calahonda square where you can sample a variety of Bars & Restaurants. This holiday apartment for rent is situated close to various golf courses in Calahonda, Miraflores Golf which offers superb facilities & perfect lawns for that long awaited hole in one. This holiday apartment for rent is only a minute walk to the local shopping centre with its nice restaurant and supermarket. The perfect sandy beach and the main shopping plaza with supermarkets, numerous restaurants, bars and nightlife is only a 6 mins drive (25 min walk) from this holiday apartment for rent. A beautiful newly built wooden promenade 6 kms along the seashore gives a unique opportunity of walking or running, chasing sunsets or enjoying dawn over the sea. The beautiful area of Calahonda is located mid way between Fuengirola and Marbella (10 kms to either way). This beautiful apartment in traditional andalusian style offers everything you may need for a relaxing vacation. 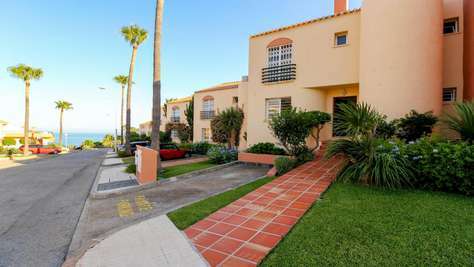 It is a part of secure urbanizarion Jardín Botánico situated in 10 minutes of walking from the Butibamba Beach and in 1,5 km from the centre of La Cala with its multiple supermarkets and restaurants. With a maximum capacity of 4 guests, it offers 1 bedroom with a big built-in wardrobe, 1 bathroom with hydro massage shower, a spacious living room with sofa bed for two and flat screen TV, and a fully equipped kitchen with dining area. The kitchen is equipped with all necessary cutlery and utensils for your cooking experiments. It provides you with a big fridge, cooking hob, oven, dishwasher, microwave, toaster, water boiler and coffee maker. Enjoy here the stunning sea views from its terrace on the second floor. Or relax with a book and a glass of wine in the large private garden with swimming pool. The apartment also offers a garage and a barbecue. Baby cot and high chair are available for an additional fee. The chic and upmarket hotspots of Marbella and Puerto Banus are 25 minutes away by car; while for culture vultures and those looking for a real slice of Spain, the beautiful city of Malaga can be easily reached by train. Some nearby cities you can visit are: Ronda (32 km), Granada (128 km), Cádiz (237 km), Seville (209 km), and Córdoba (161 km). 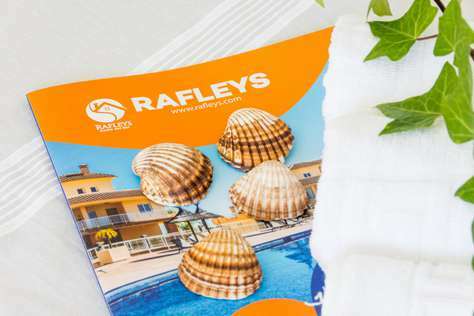 Book your excursions on the website of Rafleys! 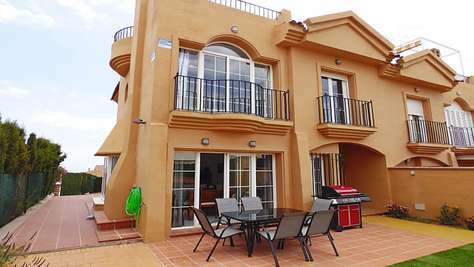 Holiday rental in La Costa del Sol. This cozy apartment is located in the very heart of La Cala de Mijas, next to Torreon at La Cala beach. With a maximum capacity of 6+1 guests, it offers 3 bedrooms, 1 bathrooms with shower plate, spacious living room, divided into dining and seating areas, fully equipped kitchen. The seating area of the living room feachures a comfortable big sofa and flat screen TV. The apartment is on the second floor with an access via elevator. The main bedroom with a king size bed has sliding doors that open onto a small terrace. It is possible to provide free Wifi upon your request. The kitchen is fully equipped with dishwasher, oven, cooking hub, microwave, coffee maker, fridge and washing machine in a small area apart. In front of the apartment you have a paid secure parking. The beach is only in 3 min. walk. Nearby you have a multiple supermarkets, pharmacies, taxis, buses on the highway, small shops and restaurants. The refundable damage deposit for this apartment is 200 euros. The location of this holiday apartment gives you a unique opportunity to enjoy the proximity of everything that you may want for your great vacation. 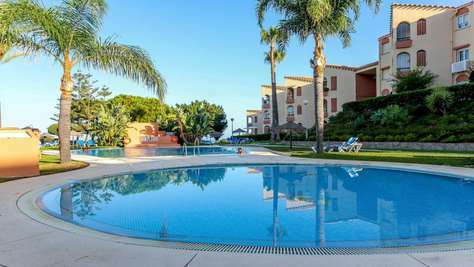 Wide sandy La Cala beach with its numerous restaurans, summer sport facilities and also supermarkets and other city perks of Cala village centre, all literally in a few minutes` walk from this holiday apartment for rent. In 10 min. by car you can find a fantastic zoo Bioparc, a water park Aquamijas and a huge shopping centre Miramar with cinema, in nearby village of Fuengirola. Also, around the area you will find a football camp, multiple golf clubs, parks and historic monuments. If you are travelling with children, you can find in handy Fantasy Land complex in 15 min. walk from the apartment. Holiday apartment for rent in Mijas Costa. Holiday apartment for rent in Fuengirola. Ref. 57762. Comfortable and modern one bedroom apartment within Club la Costa World resort. This holiday apartment for rent offers stunning sea views from both living room and bedroom. kitchen with oven, microwave, toaster, coffee maker , dishwasher and washing machine. Wifi, air conditioning troughout. The apartment features separate entrance, assigned parking place in front of the entrance door. Big swimming pool with sun beds is gated and for residents only. Beach is 3 min walking, free wee train of the resort is also available. Restaurants with daily night entertainment including flamenco show, bars, swimming pools, sport grounds, stables and tennis court of Club La Costa Resort are also available for our guests. Club La Costa World resort is family-friendly and close to both Marbella and Fuengirola highlights. This modern holiday apartment for rent is conveniently located close to all amenities in La Cala de Mijas. 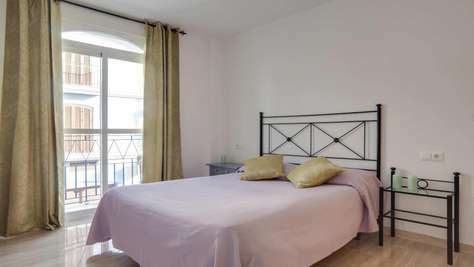 Newly redecorated and refurbished, this holiday apartment for rent offers a wide range of facilities and handy tools, which will certainly make your stay even more enjoyable. The apartment has a lovely secluded patio, surounded by a natural fence. Relax with a good book or have a glass of cava under welcoming Spanish sun, your Spanish vacation has just begun! The spacious and bright dining and living room area transcends into a convenient kitchen. In case you are passionate about cooking, you shall find yourself at home, with all equipment required to produce high-quality meals and host dinners and evenings. The bedroom of this holiday apartment is also a bright and spacious room, with all facilities guaranteed to make the guest couple's stay comfortable. There is bathroom with a bathtub and shower available for use. The bedroom features two single beds. There is a wonderful terrace opening into deck and patio, which can be used for dining al fresco. Other facilities of this holiday apartment for rent include the communal swimming pool, and a walking distance to the local beach - so get ready to jump into the water amidst the Spanish heat! This holiday apartment for rent is located in only a 5-7 mins walk from the most popular restaurants and bars in this area. It takes you only 3 minutes to find a laundry service, a pharmacy, a beauty salon or a motorcycle rental shop. Tennis court, playground with fitness machines for adults are just a 5 mins walk away. Only 7 minutes of walk and you are in El Bombo, one of the best sandy beaches of Costa del Sol. It is surrounded by 5 bars with a varied menu including skewers, seafood, barbecue and of course famous Spanish Paella. Here is also lifeguard station, playground and sports park, rental of pedal boats, or you may try motorcycles and other aquatic equipment depending on your preference (rowing, kayaks, air casts for children and much more). There is also a wooden boardwalk along the beach from Riviera del Sol through La Cala and towards the Cabopino Marina in Elviria, that is worth walking 7 minutes from the apartment. It’s ideal for walking and extends about 10 kilometers in total. Getting to Malaga Airport takes you 20-25 by car. Gibraltar is 95 kilometers away. The beaches of the Atlantic Ocean (in Tarifa) are 122 kilometers away. Best holiday best holiday lettings in Spain- villas and apartments for rent in Costa del Sol! This elegant 3-bedroom holiday townhouse for rent with a huge terrace with BBQ, a balcony, communal pool and fully equipped kitchen is conveniently located close to local supermarkets and a bunch of restaurants catering all tastes. The beach is only a 5 min drive. Private parking is available for free. 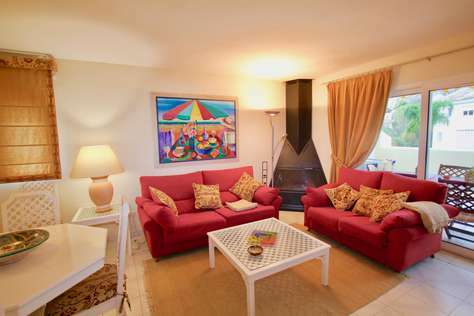 This holiday townhouse of two floors is tastefully decorated and refurbished with quality furniture. The seating area of the living room opening to a balcony with outside dining area has big comfortable sofas, a stereo and a flat screen TV. Fiber Optic + Satellite 1000 channels. The dining area sits 5. High-speed Wi-Fi and air conditioning througout. Lovely fully equipped kitchen offers all utensils you need for preparing your meals, as well as oven, microwave, coffee maker, washing machine and dishwasher. Going downstairs, on the backyard, you have two communal swimming pools accessible only for residents of the urbanization. All bedrooms have en-suite bathrooms with bathtubs. Master bedroom where you can relax on the king size bed. The second bedroom also has a king size bed. The third bedroom is perfect for children offering a trundle bed. On the upper level you will alo find a huge terrace with sun chairs perfect for a small BBQ party. 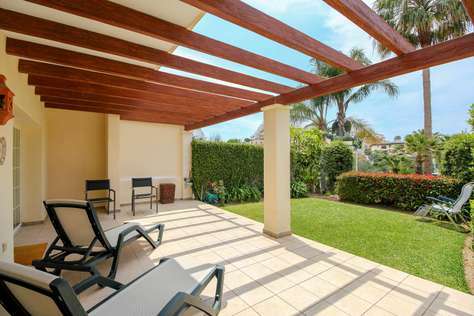 Located close to Miraflores golf courses, this holiday complex has a big and well maintained territory. A lot of amenities are available nearby, it takes only 5 minutes to reach by car the perfect sandy beach, the area of local supermarkets, bars, restaurants and the small "Olivos Calahonda" shopping centre. The local beach offers various children entertainment facilities. A beautiful newly built wooden promenade 6 kms along the seashore gives a unique opportunity of walkng or running, chasing sunsets or enjoyng dawn over the sea. The beautiful area of Riviera del Sol is located mid way between Fuengirola and Marbella (10 kms to either way). The car is essential. 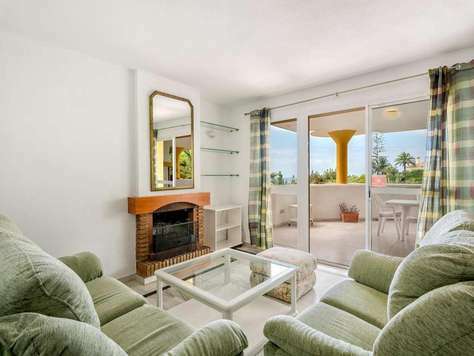 This beautiful and fully refurbished townhouse is situated in the famous La Costa World resort, close to all amenities. A really spacious home with a lot of internal space and private garden offers everything you need for your vacation. Located on the ground floor generous size living area offers a comfortable sofa, a chimney, a flat-screen TV and a dining area with table that sits 6. The floor to ceiling windows open to the huge terrace and further to the beautiful well-maintained garden. A cozy sun terrace offers second dining area al fresco. The resort area offers communal swimming pools, some of them are heated. The main level offers open plan kitchen and a guest toilet. The kitchen is equipped with all the necessary utensils, dish, glass and cookware you may need to prepare your meals. It features also a big fridge, a microwave, an oven, a stove and a dishwasher. On the top floor of this holiday home for rent there are 3 bedrooms and 2 bathrooms. Master bedroom has a king size bed and en-suite bathroom, the second bedroom has a double bed and an adjacent guest bedroom/office with a single bed. Another bathroom is available on this level. Single bed in third bedroom. Possibility of 2 extra beds/matresses for an additional price. UK chanells box on demand for an additional price. There is a gated parking in front of the building with assigned place. The area of the resort is monitored 24/7 by security. Holiday townhouse for rent sits among exotic and lush tropical gardens, restaurants, bars with programmed nightly entertainment, a mini-market, amazing, huge swimming pools, kids' pools and Jacuzzi pools, and fun to ride free little train that connects all the areas of the resort, shuttling guests for free from one place to another. Some nearby cities you can visit during your vacation in Spain are: Ronda (52 km), Granada (128 km), Cádiz (237 km), Seville (209 km), and Córdoba (161 km). 3BR Townhouse near the Golf Courses.10 mins walk to the Beach. Wifi. This elegant holiday townhouse for rent with a huge terrace overlooking the beautiful area of Riviera del Sol, private patio with sunbeds and communal pool is conveniently located close to local supermarkets and a bunch of restaurants catering all tastes. The beach is only a 5 min drive. Private parking is available for free. 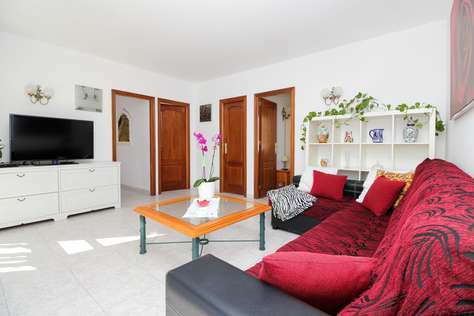 This holiday townhouse of two floors is tastefully decorated and refurbished with quality furniture. The seating area of the spacious living room opening to a private patio with sunbeds has big comfortable sofas, a chimney and a TV. The dining area sits 6. High-speed Wi-Fi and air conditioning througout. Lovely fully equipped kitchen offers all utensils you need for preparing your meals, as well as oven, microwave, coffee maker, water boiler and dishwasher. On the first floor you will also find a guest toilet room. From the patio you can walk 2 minutes to the communal swimming pool accessible only for residents of the urbanization. Master bedroom where you can relax on the super king size bed has an en-suite bathroom with bathtub with hydromassage and shower. The second bedroom also has a king size bed and adjacent shower room. Both bedrooms have access to a large terrace with views to the garden and the pool. The last bedroom offers two single beds (although there is only one bed on the photos) and a private shower room. 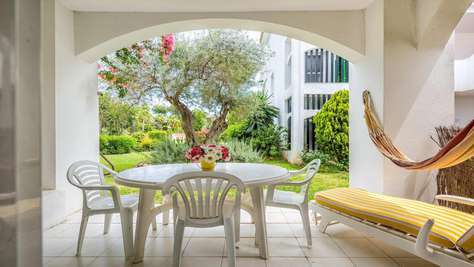 This elegant 2 bedroom holiday duplex apartment for rent with a big terrace overlooking endless golf courses of Riviera del Sol is conveniently located close to local supermarkets and a bunch of restaurants catering all tastes. The beach is only a 5 min walk. This holiday duplex for rent is tastefully decorated y newly refurnished with quality furniture. The seating area of the modern living room has a comfortable sofa bed and flat screen TV, the dining area sits 4. Fiber Optic + Satellite 1000 channels and air conditioning througout. Lovely fully equipped kitchen offers many extras including automatic coffee machine, juice maker, blender. Master bedroom offers en- suite bathroom. Relax in the king size bed feeling the comfort of its mattress and pillows, your Spanish vacation has just begun! Located just 500 meters from the beach Alhamar community has a huge territory and quiet cul-de-sac location.Three large swimming pools, including shallow children pool, lovely well maintained gardens, restaurants and supermarkets are a 5 mins walk. This elegant 2 bedroom holiday apartment for rent with a big terrace is conveniently located close to local supermarkets and a bunch of restaurants catering all tastes. The beach is only a 5 min walk. This holiday apartment for rent is tastefully decorated y newly refurnished with quality furniture. The seating area of the modern living room has a comfortable sofa bed and flat screen TV, the dining area sits 4. High-speed Wi-Fi and air conditioning. Lovely fully equipped kitchen offers many extras. A baby cot and a high chair are available for additional price of 6 euros per nigh each. Located just 500 meter from the beach Albamar community has a huge territory and quiet cul-de-sac location.Three large swimming pools, including shallow children pool, lovely well maintained gardens, restaurants and supermarkets are a 5 mins walk. 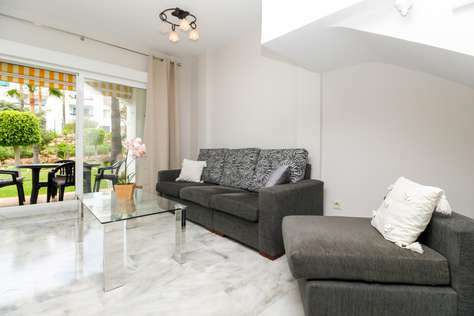 This elegant two level 2 bedroom holiday apartment for rent with a garden is conveniently located in Riviera del Sol close to local supermarkets and a bunch of restaurants catering all tastes. The beach is only a 5 min walk. This holiday apartment for rent is tastefully decorated y newly refurnished with quality furniture. The seating area of the modern living room has a comfortable sofa and flat screen TV, the dining area sits 4. The main floor also offers a guest bathroom. The seating area of the living room opens into a generous size garden with dining area to enjoy al-fresco. Two bedrooms with en-suite bathrooms are on the upper level. Master bedrooms has a king size bed, the second bedroom offers 2 single beds. Relax in the king size bed feeling the comfort of its mattress and pillows, your Spanish vacation has just begun! High-speed Wi-Fi and air conditioning. Surrounded by Miraflores golf courses, Albamar complex has a huge territory and quiet cul-de-sac location. A lot of amenities are available on-site. 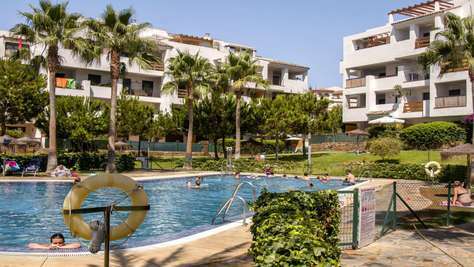 From three large swimming pools, one of them for kids, lovely well maintained communal gardens with numerous walkways, various tennis courts to the beach, supermarkets and restaurants, everything you may want is nearby. Albamar complex hosts a poolside cafe 'Tropicana' where light refreshments can be purchased. All pool areas offer sun beds free of charge and even in High Season are never overcrowded. Centrally located within Riviera Del Sol, the property is within comfortable walking distance to local bars, restaurants & supermarket, a walk through the complex will take you to the La Terraza centre where you can sample a variety of Bars & Restaurants while taking in the views over Miraflores Golf course. This holiday apartment for rent is only a minute walk to the local shopping centre with its nice restaurant and supermarket. The perfect sandy beach and the main shopping plaza with supermarkets, numerous restaurants, bars and nightlife is only a 5 mins walk from this holiday apartment for rent. The local beach offers a variety of children entertainment. A beautiful newly built wooden promenade 6 kms along the seashore gives a unique opportunity of walking or running, chasing sunsets or enjoying dawn over the sea. If you are looking for a selection of bars to sip a chilled beer a stroll down the hill will lead you to Davids & Georges & afew more new bars & restaurants or sit on the outside decking over looking the sea at Max Beach Bar. Close by you'll find the areas of El Zoco & Calypso where they provide refreshing alternatives with local & international cuisine available daily.The very picturesque marina of Cabopino (known as mini Puerto Banus) & old traditional Spanish village of Mijas where local delights can be sampled all within easy access. ** Check-ins are available only on Saturdays. 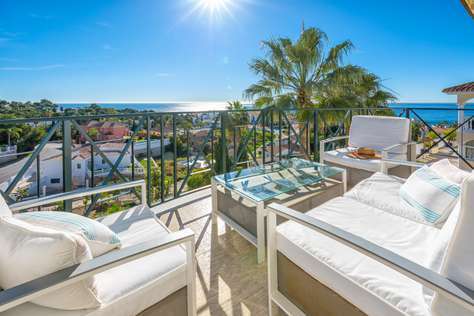 Luxury apartment is located in El Faro of Mijas Costa and only 5 min walking distance to the beach. With a maximum capacity of 6 guests, it has 2 bedrooms, 2 bathrooms, spacious living room and a spacious terrace with stunning sea and Arroyo Real views. The community is very quiet. A swimming pool and a garage parking place are available. This holiday apartment for rent apartment offers spacious tastefully decorated living room, which opens into dining area. A generous size terrace with dining table has stunning views. Fully equipped kitchen sits independently providing high quality kitchenware. Two bedrooms and both bathrooms are furnished with high standard furniture. The beach is only a 5 minutes walk from the apartment. The apartment is fully air-conditioned, with high speed internet and WIFI. 2 dining tables: one in the living room (sits 4) , one in the terrace, sits 4. Sun Loungers in the swimming pool area. More sun beds are available at the community swimming pool, included. Community swimming pools with shallow end. We also have two baby cots and two high chairs for families with little ones. The balconies is child safe. There are many bars and restaurants on Playa Marina which is a 5 minute walk. This holiday apartment sits among exotic and lush tropical gardens, very close to restaurants, bars with programmed nightly entertainment. The chic and upmarket hotspots of Marbella and Puerto Banus are less than 30 minutes away; while for culture vultures and those looking for a real slice of Spain, the beautiful city of Malaga can be easily reached by train. 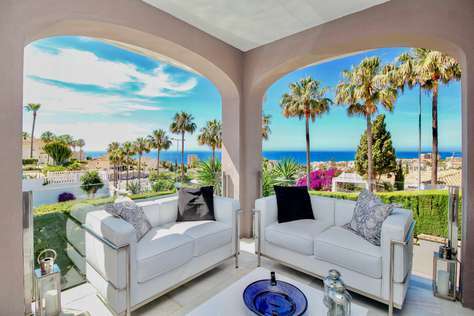 Best holiday villas and apartments for rent in Costa del Sol. Holiday apartment for rent in Riviera del Sol. Ref. 74810. 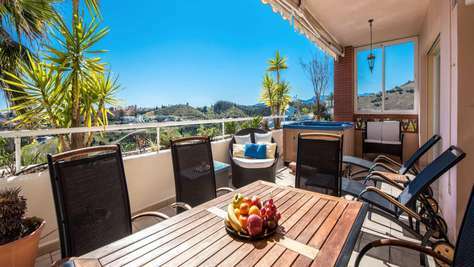 This beautiful holiday apartment for rent has an exceptional location in Mijas Costa offering stunning mountain and sea views and tranquility. The apartment is within 5 mins drive distance to the beach. With maximum capacity of 4 people, the place gives a relaxation vibe and has everything you might wish for your perfect vacation. The outstanding sensation of being in the middle of a vacation paradise comes from the connection of sea, sun and beautiful surroundings. The apartment is split in two levels. The main level offers spacious living room, divided in 2 areas. The seating area consists of a comfortable leather sofa with a coffee table in front, flatscreen TV, and slide open doors connecting to the terrace. Inside dining table sits 4. 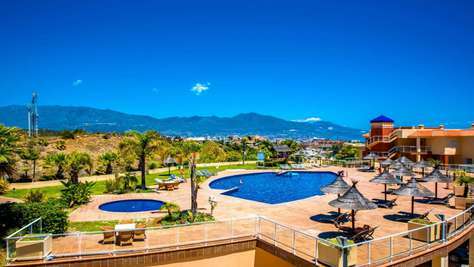 The main level has two bedrooms and spacious terrace overlooking Riviera del sol and mountains. Outside dining area sits 4. The upper level offers 50 sq m roof terrace/ solarium with sun beds and BBQ for outside dining. Access to exterior parking inside a closed community.